Zach Klempf is the founder and CEO of Selly Automotive. Never has the traditional automotive business model been under constant siege as it is today from multiple fronts. Technology has not only changed the car-buying experience but it is also relentlessly reshaping the entire ecosystem from dealership go-to-market strategies to the automobile product offering itself, all while it creates new, non-traditional competitors based on online, mobile centric utility models. Such disruption breeds opportunity and given the fragmentation across U.S. auto retailers, Buffet has an opportunity to drive consolidation among mom-and-pop dealerships and independents to lead them profitability into their digital futures. That digital automotive future is flush with capital at the moment. According to AutoVentures, there have been 33 major equity transactions and investments worth $35 billion in automotive retail over the last 18 months. The first half of 2015 saw over $105 million of venture capital investment in Bay Area firms alone that have the automotive industry specifically in their cross hairs with an approximate 60/40 split between early stage/late stage funding rounds. In addition to strong momentum from the venture capital community, major industry players like Cox Automotive are internally incubating companies like subscription-based, on-demand car service Flexdrive. They also recently acquired dealership technology company Dealertrack for $4 billion dollars this past summer. Both moves extend their relevance into the “hot” markets of Mobility On-Demand (MoD) and data centric automotive offerings. From altering the dealership ownership structure, to creating the on-demand car marketplace, to revamping back office systems, the influx of outside capital is a big game changer for an industry that has been more akin to moving at a slow pace but must start gearing up for the inevitable havoc that mobile, social, and big data technologies inevitably bring to established business models. What’s Driving The Disruption And Capital Investment? The on-demand, utility economy has had a significant influence on business models in the automotive industry and have introduced services like Beepi and Vroom. Both startups aim to simplify the $36.5 billion used car industry by enabling consumers to surf, finance, and arrange delivery of a used car via their smartphones or other online device. On the manufacturer side, new players like Tesla have challenged the traditional retail dealership model with direct sales and no franchise stores. From a product perspective, sophisticated electronics and software now account for as much as 35 percent of the total cost of the automobiles themselves,and the ever increasing software content has accelerated the pace of product innovation from years to months. As the car becomes more digitally enabled, complexity has increased to the point where some luxury cars have more custom code than today’s fighter jets. Automotive OEM competition has now expanded to include technology leaders like Google and Apple in addition to software-centric niche startups. Millennials have spearheaded disruption in the automotive industry with a major focus on pricing transparency, a preference for the ease of digital transactions, and the foundational expectation that their car should simply be an extension of their “always on” mobile lifestyles. In a recent Car Buyer of the Future study done by Autotrader with a sample size of over 4,000 customers, less than half a percent currently enjoy the car-buying experience. In a study conducted by Accenture, 75 percent of respondents would consider purchasing a car via home delivery, completely online. Today’s consumers want a faster, streamlined but personalized, no pressure, car-buying experience that allows them to purchase, finance, and insure their vehicle with the touch of a screen. They have been trained by Google, Facebook, and other digital data super powers to expect and enjoy a personalized customer experience based on their stated or inferred preferences from observed online behaviors and millions of digital data points. Why should car ownership or access to automotive mobility be any different? Much has been written about the changing automotive industry dynamics and the ramifications to the automotive OEMs. But what about the dealerships caught in the middle of the upheaval? What steps must dealers take to avoid being digitally displaced in the automotive distribution model of the future? Today’s business model consists of Tier 1 component suppliers working in concert with automotive OEMs who design, assemble, and distribute new vehicles to authorized dealers, who then sell them to consumers. It is a closed, highly regulated retail distribution model that is product centric. Foundational cracks in this model are already starting to show as the customer experience is not digitally optimized nor personalized to any real extent. It is the outdated “build it and they will come” approach. 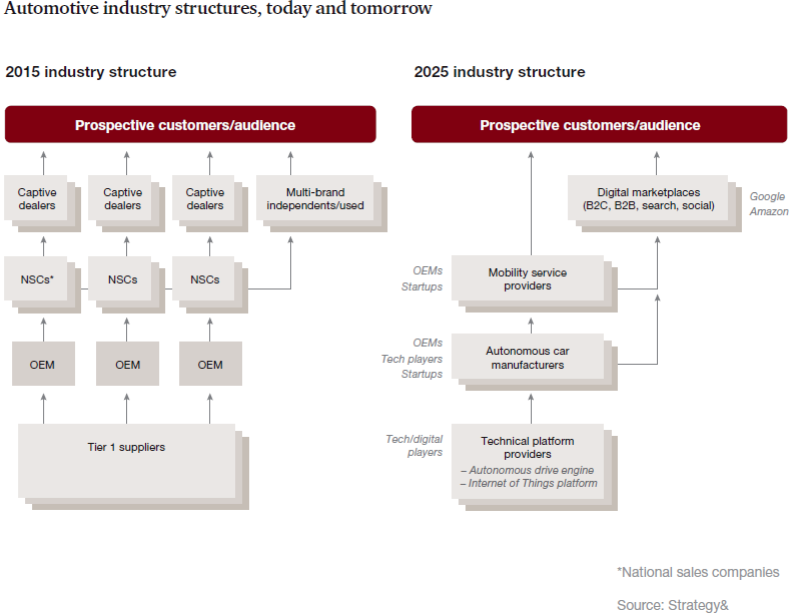 The future automotive business model shifts toward more open, connected platforms with customer centric digital services at its core. The retailing aspect of tomorrow’s new and used car sales starts to become intermingled with MoD services where car ownership is just another option on an equal footing with the on-demand and car sharing economy. A recent PwC whitepaper has a graphic that really drives home the major structural changes that are in play and highlights the dealership dilemma. The stark reality is that by 2025 the dealership model as it exists today does not exist. It has instead morphed into positions within the Digital Marketplace and/or Mobility Service Providers roles. That future vision must seem like open season to traditional dealerships that have not yet recognized this shift. To stay relevant dealerships will need to understand how to succeed in the digital marketplace for both new and used car transactions, services, and expand their offerings into becoming MoDSPs. (mobility on-demand service providers). The dealership of the future likely needs to have ties into several arenas to maintain relevance and profitability. Non-urban area dealerships need to think about how to capture their share of the MoD economy and explore providing their own MoD services to their communities before a technology competitor does. Urban area dealerships should consider partnering with the Vrooms and Beepis of the world that are already in their backyards and utilize idle shop capacity to “certify and inspect” used cars and provide last mile delivery as service providers for these new entrants. Having a physical sales presence in the local market is another “for hire” service that dealerships may be able to provide new market entrants who lack the face-to-face local contact. “Connected Car Study 2015: Racing Ahead with Autonomous Cars and Digital Innovation” 2015. Accessed November 4, 2015. Some dealers are already taking notes from Drive Shift, Beepi and Vroom and beating them with plays from their own playbook. Those dealers are now offering off site test drives to customers at their house or workplace as well as a return policy on pre-owned inventory. Dealerships also need to insert themselves into the digital data stream from the connected car in order to strengthen their ability to capture a “customer for life.” Dealers will not only need to have access to that customer data but they will have to monetize it throughout their service business, trade-in, resale, financing and MoD digital offerings. Advance sensor data may warrant a proactive service event to prevent a major problem or to prioritize safety recall efforts. Usage data may assist in the customer’s next vehicle purchase as the dealer will know more about their driving habits and “inside the car” experience preferences. Automotive OEMs may not want to share this data but dealerships need to be aggressive about securing this information as it is critical to tailoring their digital services offerings to their customers going forward. To position themselves for future success, dealerships need to understand how technology disruptions are impacting their business environment, embrace the digital revolution in their customer relationship and back office data management processes, and hone their digital marketing chops to remain relevant. They also need to think hard about the type of skill sets the dealership will need going forward that can provide, nurture, and retain the connected consumer for life across all of their automotive mobility needs. The next five years are positioned to be some of the most disruptive times in this space. The connected car is the next big product step forward and will feed the big data beast in ways yet unforeseen as the automobile manufacturers, government safety regulators, insurance companies and online search companies to name just a few start collecting vehicle usage and driver behavior data. The on-demand, sharing economy and direct to consumer model will continue to impact traditional franchise dealership models as consumers increasingly have other options to fulfill their need to get from one place to another cost effectively. Silicon Valley will continue to fund new automotive tech startups in the hope of creating future “unicorns.” It is fair to say the automotive industry is due for monumental changes and it’s an exciting time to watch Silicon Valley become the new Detroit.